As parents age, it becomes more difficult for them to live alone, and their adult children assume increased caregiver responsibilities. Statistics from a 2013 study show that nearly 47% of the U.S. population is involved in caring for an aging parent, while also raising a young child or financially supporting a child over the age of 18. 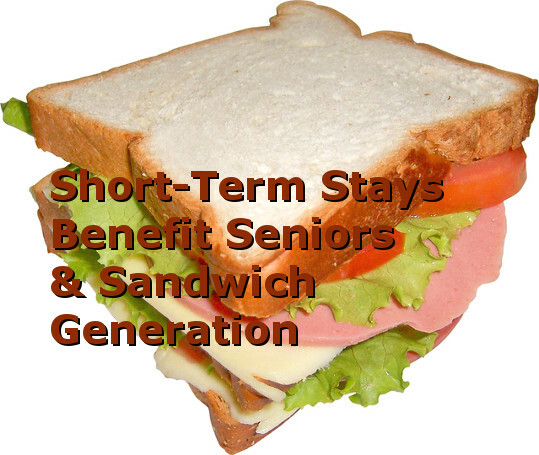 1 Known as the Sandwich Generation, these adults, mostly in their 40s and 50s, provide day-to-day care for both parents and children, as well as financial and emotional support. This sandwich role can be challenging for caregivers who are balancing careers, raising children, and caring for their parents. Running errands, acting as chauffer and cook, and tending to household chores is a full-time job. Add to this doing these same tasks at a parent’s home, and there are not enough hours in the day to do everything that needs to be done. Red Bud’s short-term or ‘respite’ care offers family members some much-deserved time off, while ensuring that their loved ones are receiving the attention they need. Respite care can be the perfect solution when children acting as caregivers need to be away for an overnight business trip, a weekend reunion, or a week’s vacation. The cost for respite care is $125 per day, and guests enjoy the same amenities as our full-time residents: meals, medication management, activities, and 24-hour on-call nursing staff. For more information and resources, please contact us. Download or Print: Is It Time for Assisted Living? Download our publication, Is It Time For Assisted Living?